NSRGC has a fairly simple Introduction to Shooting program for Young Shooters and Beginners. The program is free - rifles, ammunition, eye and ear protection are all provided. It's basically a weekly drop-in session, with shooters being coached at their appropriate level. Once a month Introductory Sessions are held for new comers. There is no age restriction as such - the practical restriction is physical size sufficient to hold a standard size rifle and enough maturity to stay focused for 2 hours in an instruct and drill format practice session. The only real structural requirement is that new comers start with an Introductory Session. 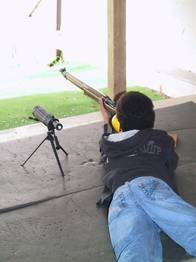 Youngster-only is the usual format, but parental participation is welcome - that is, parent and child both take part in shooting and being coached. Beginner adults looking to gain some practical familiarity with shooting are also welcome. Currently, sessions are held on Saturday from September thru the end of May. The Introductory Sessions are usually, but not always held on the first Saturday of the month. To keep everybody in the loop, I send out an e-mail mid-week detailing the plans for the next session. Interested parties can send an e-mail to NSRG Juniors for addition to the weekly notice that I send out with specific details, minor changes of plan, etc. Just to repeat, first session for a shooter entering the program needs to be the Introductory Session (even if they have shot 'lots' somewhere else - while the material may be 'known', they get familiar with the range itself, how we do things, my personal teaching style and how I like things to go). The Introductory Session is the most formal session for obvious reasons. Regular program attendees will usually skip this monthly session as it is deliberately slow paced. This session includes a principles of rifle and range safety lecture, introduction to the operation of the single shot .22LR rifles that we use and, of course, some time on the range actually shooting. Initial shooting is done with step by step incremental instruction (lie down, pick up your rifle, open the action, load a round, close the action, etc.) to build familiarity with the mechanics of firing the rifle, and moving towards the more standard instruction format (relay purpose and action description, fire in your own time, commence firing, all finished on the line, make safe and stand back) used to allow practice of the details of precision shooting. I've found that having several participants at an Introductory Session seems to be more comfortable, especially if they know each other somewhat outside. A single new shooter tends to end up feeling over scrutinized. Loosely translated: bring a friend along. Shooting is done from a concrete pad in a roofed structure, so rain, snow, hail aren't an issue, but the shed is open sided, so temperature and wind and humidity are factors. Dress should be rough, comfortable work/play clothing, in multiple thin layers. Winter, spring, and autumn, the range is cooler than you generally expect, and in summer, it is often warmer than expected. Multiple thin layers allow easy adjustment for the specific range conditions. Long sleeves and long pants are strongly recommended as most shooting will be done lying down. Feel free to send e-mail to NSRG Juniors with specific questions about any matters relating to the Young Shooter's program that aren't covered by the above. * Subject to change due to rentals and other special events. Please check the NSRG Range Schedule Calendar for any changes.